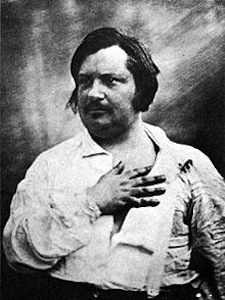 Born in 1799, Honore de Balzac, a novelist and playwright, is best known for presenting a panorama of French life and a founder of realism in European literature. His collection of short stories and novels, La Comédie Humaine (1832), focused on the years after the fall of Napoleon, in which he provided keen observations and uncensored details of French society. Balzac's working class realism was compared to Charles Dickens, and he is credited with influencing contemporary realism authors both in Europe and America, including Gustave Flaubert and American expatriate novelist, Henry James. Balzak found love and married late in life. His personal experience was in keeping with the tragedy he detailed in some of his stories-- he died just five months after his wedding in 1850.